Boxer John McCallum admits his career in the ring hasn’t quite gone according to plan. The 29-year-old says his frustrations have sometimes got the better of him having contested a measly 11 bouts since making his professional debut eight years ago. He has had his hand raised in ten of these contests with his first and only defeat coming against former professional footballer Leon McKenzie, in October 2015. 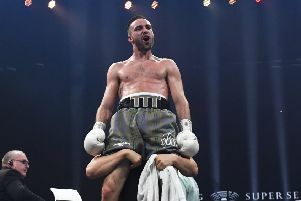 The Edinburgh fighter, who now resides in Melrose, still maintains that was a duel he would have won had the fight not been stopped after six rounds due to a cut he sustained to his right eye. Nevertheless, McCallum isn’t keen to focus on the what-ifs but will instead channel his energy into securing his first victory since defeaing Hungarian Norbert Szekeres at Meadowbank just more than 18 months ago. The former British super middleweight challenge belt holder faces Andrejs Pokumeiko of Latvia at the Gilvenbank Hotel in Glenrothes tomorrow night. Now operating at light heavyweight, McCallum believes a victory in Fife will give him the platform to relaunch his career. “It’s been a really frustrating 18 months out of the ring through injury and opponents pulling out,” McCallum explained. “I’ve been training full time for the fight so my sole focus has been on tomorrow. It’s a really small hotel but it’s sold out. I’ve always had a good support no matter where I’ve boxed. I still want to win as much as I can despite a lot of people telling me to walk away. I’m throwing everything at this one that’s for sure. I still don’t feel I have lost in my pro career because I was beating Leon MacKenzie 5-1 before the fight was stopped due to my eye. If all goes according to plan tomorrow night then McCallum expects to be in contention for a British title eliminator later this year. “That’s my thinking but the second fight hasn’t been confirmed yet,” he said. “I just need to get through this one first. A lot of people want to see if I’ve got anything left in the tank. I want a fight that’s going to rank me straight in the light heavyweight division and something that really motivates me. “The way I see it I’ve nothing to lose. All these guys ahead of me have British titles and Olympics medals. I don’t have either so it’s a win-win for me. It’s up to me to upset the apple cart. I’m getting older as well so it’s not as easy to make weight all the time. McCallum was scheduled to fight Capital rival Tommy Philbin last summer but withdrew after damaging his rotator cuff. His no-show led to a tirade of abuse online. “I stay off social media now so I’m not interested in what others have got to say,” McCallum said. “I don’t have any problem with guys like Tommy Philbin. It’s a lot quieter down in the Borders where I stay. I’m always back in Edinburgh because my family stay there.